Zendesk's customer service software and support ticketing system is used by more than 200,000 organizations worldwide. Many of those companies frequently need to collect sensitive files from customers as part of their customer support workflow. To address this need, SendSafely offers multiple integration options for Zendesk users to securely exchange inbound and outbound files. Using SendSafely with Zendesk not only results in added security through our end-to-end encryption, but also eliminates the 20MB maximum file size limit imposed by Zendesk. SendSafely offers three integration components for Zendesk. Zendesk Portal Widget - Used by non-agents (your customers) to attach files when creating or updating a Zendesk ticket in the Zendesk Support Portal. Agent Sidebar App - Used by Zendesk Agents for viewing/downloading files and for sending files to end users. In this blog post, we'll give you a quick overview of how you can use each of these components to securely exchange files with your customers using Zendesk with SendSafely. 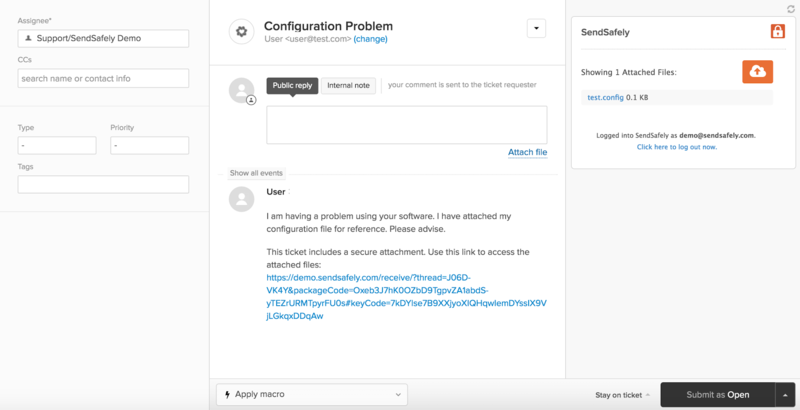 Our SendSafely Zendesk Portal Widget allows your customers to securely submit files when using the Zendesk Support Portal to create a new ticket or reply to an existing ticket. Files are uploaded directly to SendSafely, which means end-to-end encryption and no file size limits! Once the widget is installed the Attachments section of the ticket screen will display the orange SendSafely padlock icon instead of the standard Zendesk attachment paper clip (see below), indicating that attached files will be transferred using SendSafely. 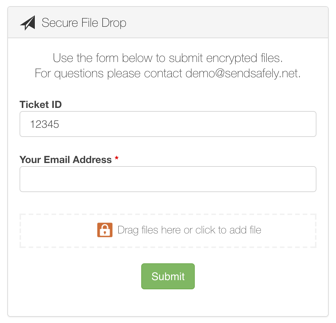 Once the ticket is submitted, a secure link to access the file in SendSafely is automatically inserted into the footer of the ticket and is visible to agents. Agents can seamlessly authenticated to SendSafely in order to access the attached files. 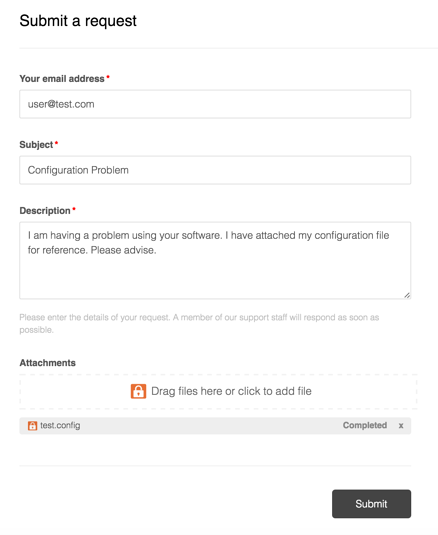 Instructions on how to install the Support Portal Widget in your Zendesk portal can be found here. 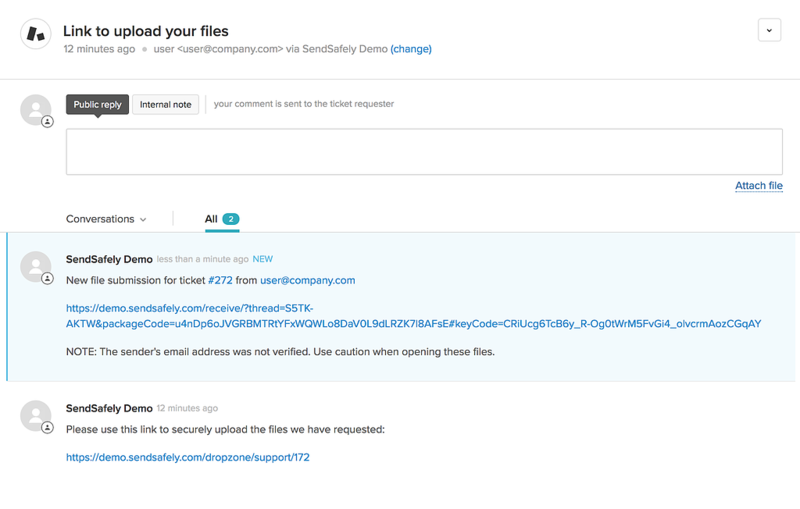 Our Agent Sidebar App streamlines the process of viewing files that were attached to the Zendesk ticket using SendSafely. The app runs in the sidebar of the Zendesk Agent interface when viewing or editing a ticket. As agents view tickets, any files that are associated with each ticket are displayed in the Sidebar App and accessible to to the agent. The Agent App also enables agents to send encrypted files to customers. Instead of using the built in Zendesk "Attach file" button, the agent can attach an encrypted file using the orange SendSafely cloud button. A link for the customer to access the files is automatically inserted into the agent's reply. Agents can also choose whether authentication is required in order to access the attached files. The SendSafely Agent Sidebar App can be installed for free from the Zendesk Marketplace. The SendSafely Dropzone is an alternative to the Support Portal Widget and is useful for cases where your customers do not use the Zendesk Support Portal. The Dropzone is hosted by SendSafely and can be branded with your company's logo and color scheme. In order to upload files, agents can send customers a link to the Dropzone. The cutomer's ticket number can also be embedded in the link so it is pre-populated for the customer. 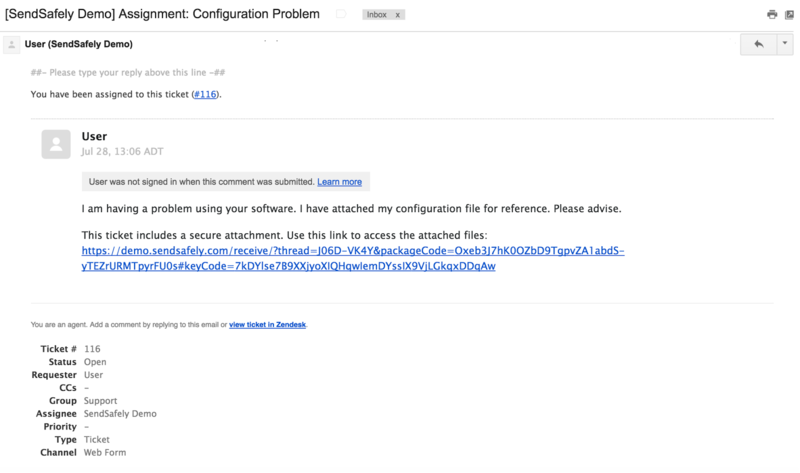 When files are submitted, the Dropzone Connector posts a message to the Zendesk ticket that includes the email address of the submitter along with a secure link to access the files. Dropzone Connectors are currently available for Google Apps and Zapier. 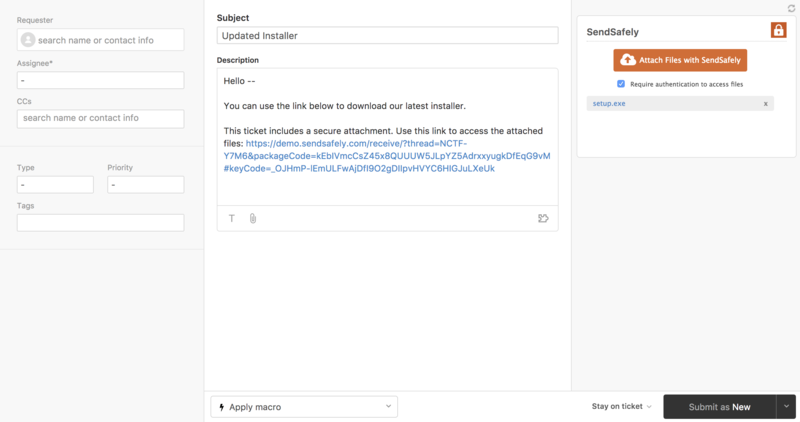 For instructions on how to configure the SendSafely Dropzone and Zendesk Connector, contact our Support Team. If you are a Zendesk customer looking for a secure way to transfer files with customers, or simply need to send large attachments using Zendesk, our platform might be right for you.